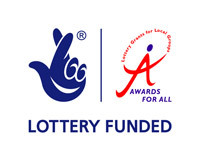 14th July 2014 Transfered April, May and June Meetings from the Home Page. Tuesday, 1st April 2014 . At Oaklands Museum, Moulsham Street, CM2 9AQ. "Maritime Radio". by CARS President, Carl Thomson, G3PEM. 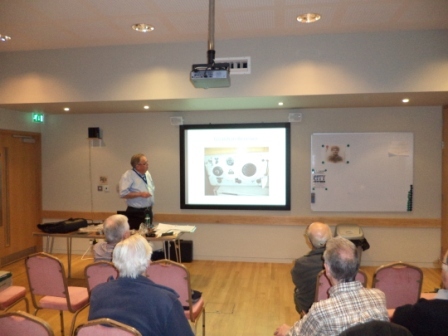 Although the CARS meeting fell on April Fool's Day a good number of CARS Members and visitors turned up to hear Carl present his evening of Maritime Radio. It was nice to meet in the light as the clocks have now changed to BST. 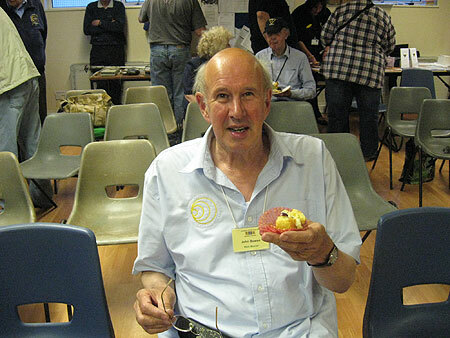 The evening started with CARS Chairman, John Yates, G1UZD talking about what the club Members had worked as the 10 Metre and to some extent the 12 Metre Bands had been quite open during the previous month. 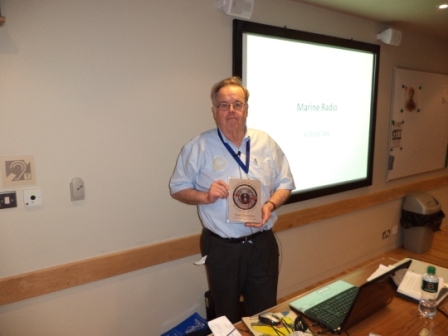 The Meeting was passed to Carl who said that he had a lovely surprise to receive through the post - a Glass Certificate from Radiodays in Holland. Carl was Chief Engineer years ago on Radio Caroline and this commemorated that event. Carl started off his talk by giving some of the history of the first ships and installation fitted with wireless. This laid the foundation for the May presentation by John Bowen, G8DET on the rescue of persons from the Empress of Ireland in May 1914. Carl told numerious very interesting stories of events whioch happened during his career with Marconi. 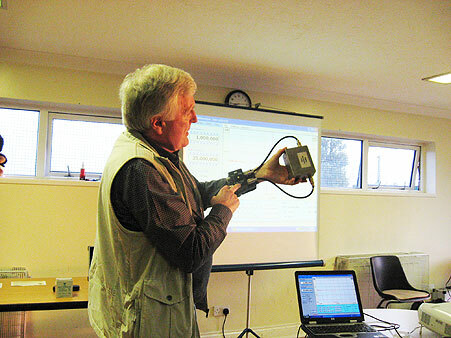 Carl showing a photograph of a transmitter. Illustrated by photographs of the 1950/1960's equipment displayed at the Sandford Mill Museum. Carl went through many of the well known Transmitters and Receivers used at both sea and shore stations. 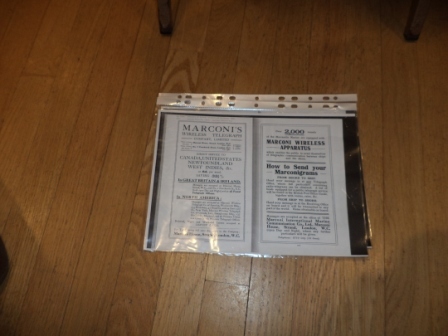 Carl circulated a number of historic Marconi documents. During Question Time someone tried to draw Carl to talk his experence Radio Caroline but he was not to be drawn. Another superb CARS Evening in our new venue. Tea/coffee was well served by David and Myra Davies - well done and thank you. CARS had its now famous Raffle with lots of great prizes. 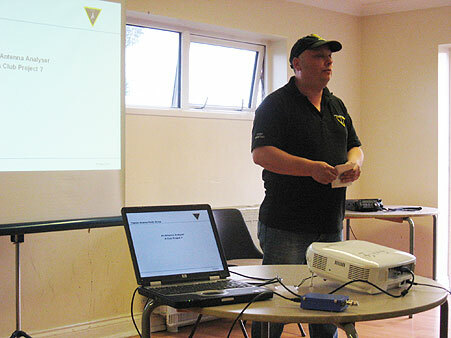 Treasurer Brian, G3CVI was in attendance to receive Membership fees for 2013/2014 of £15. John G8DET brought along 7 boxes of Fan Fold paper which were well received and taken away. 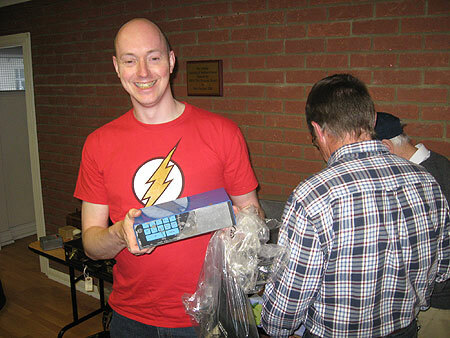 Andrew Kersey, G0IBN brought along some Silent Key items which again were well received. Thanks to David from the Museum services who looked after us all in a very professional manner. Tuesday, 6th May & Thursday 29th May 2014 . At Oaklands Museum, Moulsham Street, CM2 9AQ & Sandford Mill. "RMS Empress of Ireland". by CARS Vice President, John Bowen, G8DET. CARS tries to record each of the major events which happened 100 years ago and involved Marconi. Unfortunately many of these events involved the rescuing of persons from drowning but also involved the death of many as well. Without the Marconi Wireless the death toll would either be much greater or total. On Thursday, 29th May from 9am to 5pm CARS will be transmitting from Sandford Mill to remind the World of the Empress of Ireland Event which happened exactly 100 years ago to this day - using GB100MWT. Members of CARS, Marconi Veterans and Radio Officers Association are welcome but unfortunately members of the general public are not invited for this event. CARS will be using GB100MWT for the rest of this year. John started the evening by telling a short story of the SS Voltunno which caught fire mid Atlantic in October 1913. Marconi Wireless alerted 10 ships but storm conditions meant rescue was not possible until next day when 500 of the 650 persons on board were saved. An Oil Tanker solved the problem by pouring tons of Oil on the raging seas and calming it - so enabling the lifeboats to be used. CARS missed commemorating this event. The RMS Empress of Ireland set sail from Quebec on 28th May 1914 with 1054 passengers and a crew of 420 and headed down the St Lawrence River. In the early hours of the 29th May she was rammed and sank in 14 minutes. John told the intriguing story in preparation for CARS Operating from Sandford Mill on Thursday, 29th May 2014, exactly 100 years after this event. Captain Kendell was responsible for alerting Scotland Yard that Dr Crippen and Ethel were on the ss Montrose - arranging for Chief Inspector Dew to get to Father Point ahead of them - dressed as Pilots and arrested Dr Crippen before he set foot on Canadian soil. It was Captain Kendell's first command of the Empress of Ireland on that fateful day when she was rammed by the collier, the ss Storstad in thick fog. The hero of the day was Mr Ronald Ferguson, who later became CARS President, G4VF for 25 years and was Director of Marconi International Marine Company (MIMCo) in Chelmsford. 465 persons were saved but unfortunately 1,012 were lost. After G8DET's presentation, Tony G4YTG had a nice A5 Souvenir Booklet for sale for the staggering amount of 50p. CARS had its famous Raffle and Members had the opportunity to have a cup of tea/coffee and a social chat during the break period. Combined CARS & TARG Meeting. Friday, 6th June May 2014 . At TARG. "Tell, Show & Table Top Sale". CARS did not have a Meeting in Chelmsford on Tuesday 3rd because we went on a beautiful evening to TARG at Canvey Island to share in their Event and Table Top Sale on Friday 6th June. Combined TARG & CARS Meeting - Chairman, Tom, 2E0TNC opening the meeting. Due to the lack of uptake of tables for the Table Top Sale TARG made a few changes to the evening. 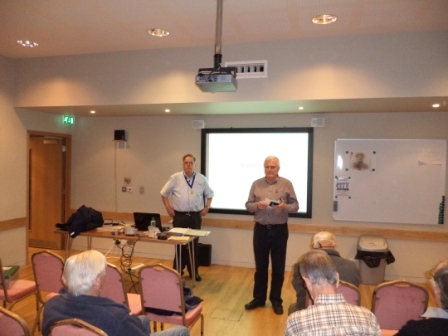 Instead of being just a Table Top Sale, TARG had a Show and Tell session for the first part of the evening where members can bring along a piece of radio kit and give a 5-10 minute talk about it. It could be home brew, shop bought, second hand or brand new, the only stipulations are that it must be radio related and it must work. 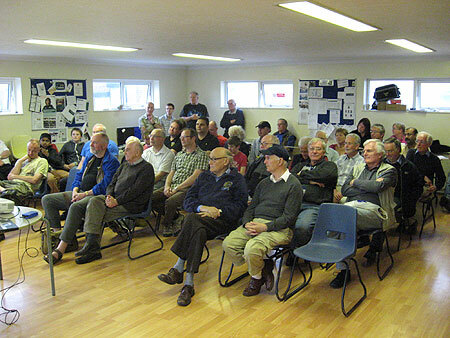 The full Meeting Room with both TARG and CARS Members together with a number of Visitors. Andy Tyler, G1GKN (left) and John Yates, G1UZD. Andy started the Show and Tell session off by explaining he had bought a nest of Aluminium Briefcase boxes and the smallest was just able to house 3 off 17Amp/Hour Sealed Batteries for driving his new FT897D rig. 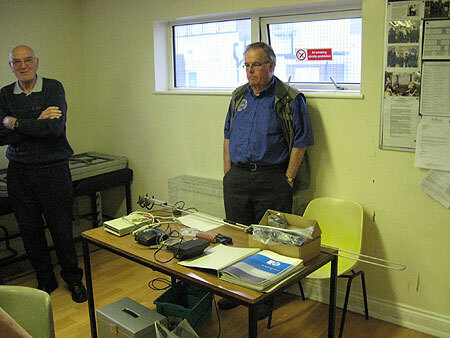 He then showed what he thought woukld make a good TARG Club Project - a Computer controlling Aerial Analyser for DC to 60MHz. This was purchased as a Kit from America for £41 and came with all the Surface Mounted componets already in position from India! He demonstrated the unit measuring a 75 Ohm Dummy Load. John G1UZD then took the floor and showed a MFJ Shorting Switch Link which he places in the Aerial Lead to switch in and out a Filter to block stray signals getting into Band II FM Radios. Both speakers were warmly applauded for their contribution to the evening. After the talks were over the room was turned over over to those who had asked for tables, Andy G1GKN, David G3SVI, Carl G3PEM and Colin to sell their wares. John G8DET produced a box of Die Cast Boxes for FREE! Andy doing brisk trade while Carl is waiting for thisgs to warm up. 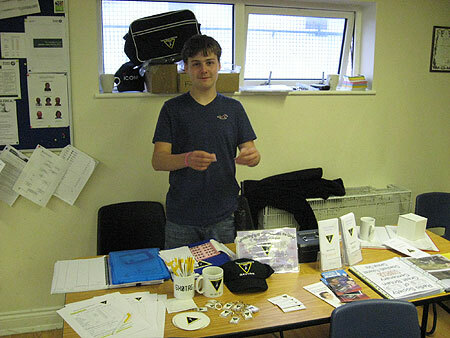 Luke standing by the Committee Table with a satified Box Customer. 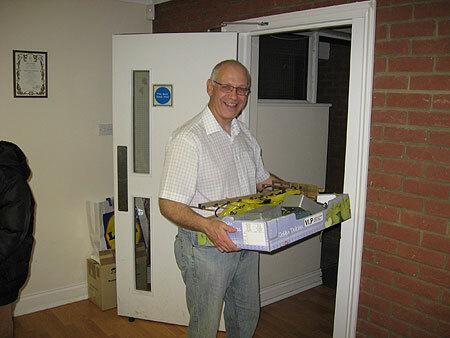 Those Boxes not taken were hoovered up by Graham and taken to another Club. All CARS members were be made welcome at TARG with numerous cups of tea and splendid (Cup) Cakes made by Belinda and Ann Tyler. 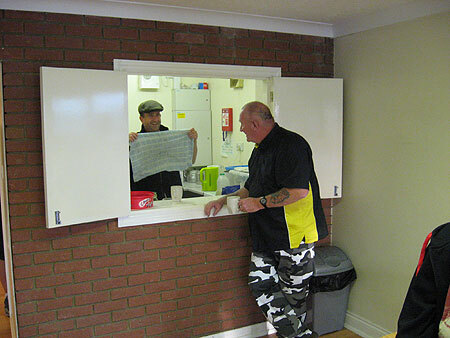 The Cafe Room which dispensed lovely warming drinks and Cakes. John G8DET seen here enjoying one. 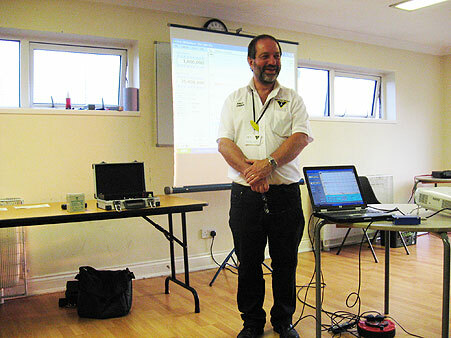 Later the TARG new club Kenwood TS480 SAT radio was demonstrated connected to a 24ft Vertical and a "L Match". A very successful evening with a good social component. Thank you TARG for inviting CARS - we all enjoyed it.